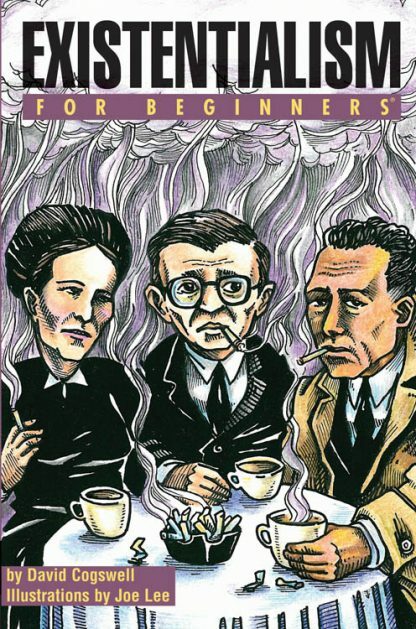 Existentialism For Beginners is an entertaining romp through the history of a philosophical movement that has had a broad and enduring influence on Western culture. From the middle of the Nineteenth Century through the late Twentieth Century, existentialism informed our politics and art, and still exerts its influence today. Tracing the movement�s beginnings with close-up views of seminal figures like Kierkegaard, Dostoyevsky and Nietzsche, Existentialism For Beginners follows its intellectual and literary trail to German philosophers Jaspers and Heidegger, and finally to the movement�s flowering in post-World-War-II France thanks to masterworks by such giants as Jean Paul Sartre, Albert Camus, Simone de Beauvoir, plus many others. Illustrations throughout � at once lighthearted and gritty � help readers explore and understand a style of thinking that, while pervasive in its influence, is often seen as obscure, difficult, cryptic and dark. Existentialism For Beginners draws the movement�s many diverse elements together to provide an accessible introduction for those who seek a better understanding of the topic, and an enjoyable historical review packed with timeless quotes from existentialism�s leading lights. David Cogswell is a writer based in Hoboken, N.J. He has written thousands of articles on business, travel, politics, and the arts for various print and online publications, including Democratic Underground, Bushwatch, Prison Planet, Indymedia.org, Fortune.com, Travel Weekly, the Hudson Current, and the Jersey Journal. He has contributed pieces to a number of political books, including Fortunate Son, The Making of an American President, by J.H. Hatfield; Ambushed: The Hidden History of the Bush Family by Toby Rogers; and America�s Autopsy Report, by John Kaminski. He�s the publisher of the political and media commentary website HeadBlast (www.davidcogswell.com), which was banned in China and named as a notable antiwar website by The Guardian.